NEW YORK (AP) — Less than two years after he shook up the New York fashion world with a splashy runway debut for Calvin Klein, designer Raf Simons is leaving the company. The company and the Belgian designer announced they had "amicably" decided to part ways after Calvin Klein "decided on a new brand direction different from Simons' creative vision." A representative for Simons said in an email Friday night that the designer would have no further comment. Simons revitalized Calvin Klein with his hip European sensibility after being appointed chief creative officer in 2016. His New York Fashion Week shows were the talk of the industry, beginning with his February 2017 debut, which had a clear political message, opening and closing with the David Bowie song "This is Not America." Simons, 50, who previously worked at Dior and Jil Sander, brought an artsy European approach to the iconic American brand, often citing numerous cultural references — but especially Hollywood — as inspiration. In September, his runway show riffed on the movie "Jaws," with models in various types of wetsuits strolling in front of enormous screens depicting a glistening ocean. 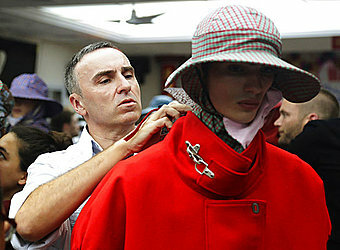 Some of models wore tasseled caps and robes; Simons was also riffing on "The Graduate." As was typical, that show was attended by a slew of celebrities including Nicole Kidman, Margot Robbie, Laura Dern, and — straight from a premiere party — the cast of "Black Panther," including Michael B. Jordan, Lupita Nyong'o and Chadwick Boseman.